Does anybody have tips on how to refill the one pound propane tanks (small green ones) all the way? I made an adapter to refill them from a normal grill tank but it only fills them half full, turns out a lot cheaper than buying new ones all the time and saves them from the landfill as well. So, does anyone know a work around for the tanks with the tip-over protection devices inside them? Own my own, but 'they' made me trade in my old ones when I went to refill them, so all I have are the ones with the overflow protection. I did this for years until the 20lb cylinders started having the valves inside them to stop the liquid from coming out when the bottle is turned over. How do you bypass that 'useful' feature? Tipping the big tank up side down seems like the best way to go. One thing I learned from an hvac guy about putting R134 in my car is to put the can in a bucket of hot tap water. It expands the refrigerant and forces it out of the can. Freeze the green bottles. The big bottle at room temp or warmer. If they dont fully fill because the temps arent right just toss them back in the freezer over night. They top off even easier(I think the propane makes them colder) when you go to finish filling them. Thanks! I tried where you push/pull the valve and it didn't close correctly after so I scrapped it. I will have to try some of the other ideas. 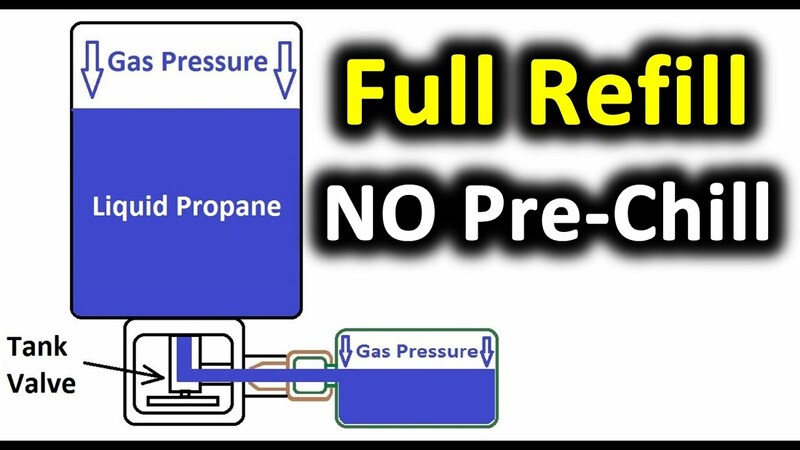 If the valve isn't working right, one other thing that will help you get a little more propane in the 1 lb. tank is to put it in a freezer for a while. What air is in the 1 lb. tank will contract allowing more propane to enter. This still will only get you a little over half full, but still cheaper than purchasing 1 lb. tanks all of the time. This is probably the best video I've found that explains it perfectly. Use ones with the little valve to the side of threaded port. tip 20lb upside down, depress valve while filling to let out gas so liquid can come in. WARNING DO NOT FILL 100% FULL!!!!!! NEED ROOM FOR EXPANSION OR CHANCE OF BURSTING, it will fill rapidly, if too full bleed some off. I use the one that Cabelas sells. I tip my 20 pound propane tank upside down and leave it overnight and the pound can is full the next morning. If I don't do this then it seems to never fill.